Ain’t no mountain pie enough? 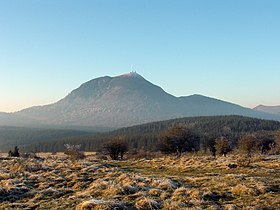 We live just over an hour away from the amazing Puy de Dôme. This vegan take on the shepherd’s pie, using puy lentils and aduki beans, is our tribute to this natural monument. Fry the onion and mushrooms in olive (or sunflower) oil until the onions are soft. Add the garlic. Add carrots. Bring to boil then turn down heat and cook until carrots start to soften (about 5-10mins). Add the rest of the ingredients. Simmer gently, adding water from the potatoes (see below), if necessary until it resembles a thick stew (bear in mind that more water will be absorbed during the oven cooking process. 1 ½ kg potatos – pealed chopped quite small and boiled, with ¼ tsp salt, until soft. Drain and reserve the liquid to add to the mixture above, as required. Take 4 -6 cocottes (or if you want one rectangular lasagne dish). Distribute the bean mixture between the cocottes. 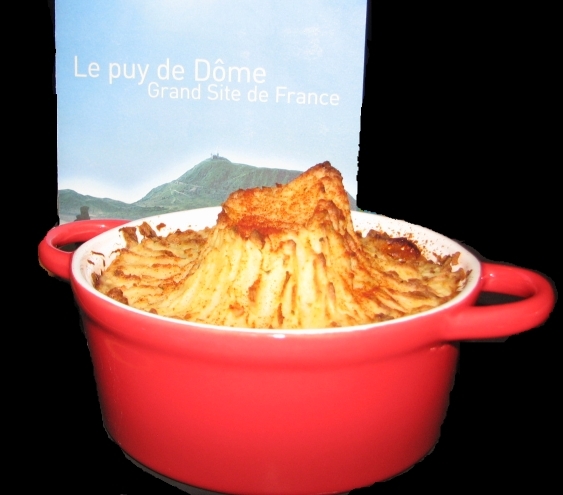 Pile the mash on top of the mixture and fashion it into a volcano shape (this is playing with your food – don’t tell your mother!). Pop in the oven for 30 minutes, until the mashed potato is browned. Serve with grean beans, peas or salad.